If you’re looking for a vacation destination that offers relaxation, adventure and beauty, Hawaii is the place for you. Hawaii is made up of eight islands and is located in the heart of the Pacific Ocean. While it is a US state, its culture is completely different than the rest of the country. The Hawaiian culture dates back about 1,500 years and has roots in Polynesia. While every island of Hawaii is beautiful and full of incredible natural treasures, each of the six main islands offers something unique. 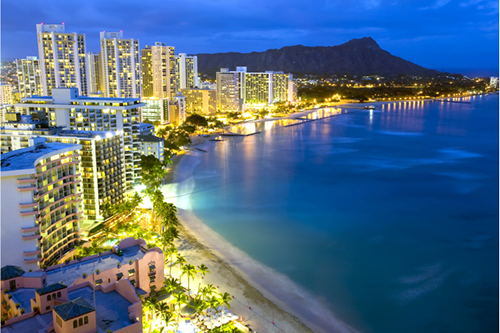 Oahu is the most cosmopolitan island and is home to the capital city of Honolulu. Maui is the ‘Valley Isle’, known for its mountains and incredible national parks. Kauai is the ‘Garden Isle’ and is teeming with rainforests and waterfalls. The ‘Big Island’ of Hawaii has great snorkelling, scenery, and coffee plantations. Molokai and Lanai are rustic islands that give a great glimpse into the authentic spirit of Hawaii. When you plan your trip to Hawaii with Webjet, you can save big by bundling together your flights and hotel costs. Webjet provides package holidays and deals to Hawaii that can help you save hundreds of dollars on your Hawaiian vacation. Webjet offers flights from airports all across Australia, as well as hotels to suit every price range. Book your Hawaii holiday package today and start planning for your experience in the tropical paradise of Hawaii. Flights are available from Australia to Hawaii each day on a variety of airlines. Webjet’s Hawaii packages include flights from airlines such as Qantas, Jetstar, Hawaiian Airlines, Fiji Airways, Air New Zealand, and American Airlines. Direct flights to Honolulu are available from Sydney, Melbourne and Brisbane, which will get you to Hawaii in about 10 hours. Travellers flying from another Australian city may arrive in Oahu with just one short stopover. If you’re heading to one of the other Hawaiian islands, you will likely need to catch a connecting flight from Honolulu. Where can you stay with your Hawaii Holiday Package? Right in the heart of Waikiki Beach in Honolulu, this resort offers amazing views of the ocean and Diamond Head. The resort is located on Kalakaua Avenue, which is Honolulu’s main shopping and entertainment strip. Outrigger Waikiki Beach offers beautiful rooms and amenities, such as a spa, fitness centre, swimming pool, surfing lessons, and complimentary yoga on Saturday mornings. The Laylow is a stylish hotel located in the Waikiki neighbourhood of Honolulu. The hotel has a beautiful pool, an outdoor bar, great views of the city, and beautiful designs throughout. The hotel is surrounded by some of the best shopping and dining in the city, and the concierge can arrange tours and day trips for you, including hikes, sunset cruises and excursions to the island’s North Shore. This hotel is a great option for travellers who want to experience luxury without blowing the budget. On the outside, the hotel feels like a true tropical paradise. It’s located right beside the beach near Kahului and is surrounded by palm trees and tropical plants. Inside, the rooms have a modern design with amazing ocean and garden views. Hotel amenities include a rooftop pool and sundeck, a restaurant, fitness centre, and free shuttle services to the airport and places within a five-kilometres (3 mile) radius. The Royal Lahaina Resort is located on the oceanfront, supplying guests with beautiful views and easy beach access. The resort offers rooms in a range of prices, including standard hotel rooms with a balcony and view, as well as premium beachfront cottages. The resort is full of amenities, including a spa, three pools, an oceanfront restaurant and bar, and an authentic Hawaiian luau on site. This family-owned inn has been operating in Kauai for more than 100 years. The Kauai Inn has a historic plantation style, which is a traditional form of architecture in Hawaii. The inn is perfectly located on the island of Kauai, within close proximity to the airport, beach, restaurants and tourist attractions. The inn has a beautiful design that will have you feeling like you’re in paradise. Amenities include a pool, barbecue area, a complimentary breakfast, and a concierge to help plan your island excursions. As its name suggests, this hotel will have you feeling like royalty. The Kings’ Land is located in the northwest of Hawaii’s Big Island and enjoys easy access to the beach, a golf course, shops, and restaurants. The Kings’ Land is family-friendly and has some great amenities at its guests’ disposal. There are two outdoor spas and two pools with a water slide, a complimentary shuttle to the nearby shops, a restaurant and poolside bar, and activities for children. Hawaii is full of great hikes. One of the best is located right in Honolulu, only a short distance from the centre of Waikiki. Diamond Head is an inactive volcano with a relatively easy hour-long hike to the top. From its summit, there is an incredible view of Honolulu, the ocean, and the bright green Hawaiian landscape. The Hana Highway is a scenic stretch that hugs the north-east coast of Maui, starting in Kahului and stretching about 80 kilometres (50 miles) to the town of Hana in the east. Including a drive on the Road to Hana is a great way to see a lot of Maui in a short period of time. The highway is dotted with amazing views of the ocean, waterfalls and rainforest. Visitors can book onto a tour of the Road to Hana, but the best way to experience it is to rent a car and do a self-driving tour at your own pace. Do take note that some sections of road can be treacherous, so some car rental companies do not allow their vehicles to be taken on the highway. Some of the most notable stops along the Road to Hana include Waikani Falls, Paia Town, Twin Falls, Kahanu Garden, and Waianapanapa State Park. The attack on Pearl Harbor is one of the most significant historical events to happen in Hawaii. The bombing of Pearl Harbor took place in December 1941 and is the event that brought the United States into World War II. Today, you can visit the spot where this occurred to learn about the bombing and how it affected Hawaii. Pearl Harbor is located in Honolulu and is made up of several memorials, including ships, a submarine, and a museum. Luaus are traditional Hawaiian parties that are a great way to learn more about local culture. Luaus always involve a huge feast of local dishes, Hawaiian music, and hula dancing. Throughout each island of Hawaii, you can find a traditional luau to attend every night of the week. Check with your hotel to see which luaus are located nearby. When you book a holiday package to Hawaii, you’re probably excited for all of the incredible beaches. Throughout Hawaii, you’ll find seemingly endless stretches of beach with soft white sand and warm, clear water. Some of the best beaches to visit in Hawaii include Waikiki Beach, Lanikai Beach, and the North Shore on Oahu; Kaanapali Beach and Wailea Beach on Maui; Hanalei Bay and Tunnels Beach on Kauai; and Hapuna Beach and Kua Bay Beach on the Big Island. No matter which beach you visit, you won’t be disappointed. Many of the beaches also have great snorkelling where you can view colourful coral and tropical fish. Many Hawaiian beaches are also known for their world-famous surfing. Lots of lessons are available to improve your surfing skills. If you’ve never tried surfing before, what better place to try it for the first time than on vacation in Hawaii? There is no bad time to book cheap flights to Hawaii. Temperatures are stable and beautiful throughout the year. And while winter experiences more rain than the summer months, precipitation and humidity are still low. Summer and winter are the high seasons for a vacation in Hawaii, and during these seasons, you’ll experience larger crowds and higher hotel prices. If you are planning to book a holiday package or travel deals to Hawaii for its famous surfing, you may want to consider braving the crowds in the winter, as this is peak time for surfing. Surf is at its best with great waves and regular surfing competitions. Outside of surfing season, the shoulder seasons from April to early June and September to mid-December are great times to book Hawaii holiday packages and travel deals. The weather is perfect, the islands aren’t quite as busy, prices are at their lowest, and there are lots of festivals and events to keep you entertained while on vacation.